Illyrio Mopatis is a wealthy and powerful man from the Easteros city of Pentos. 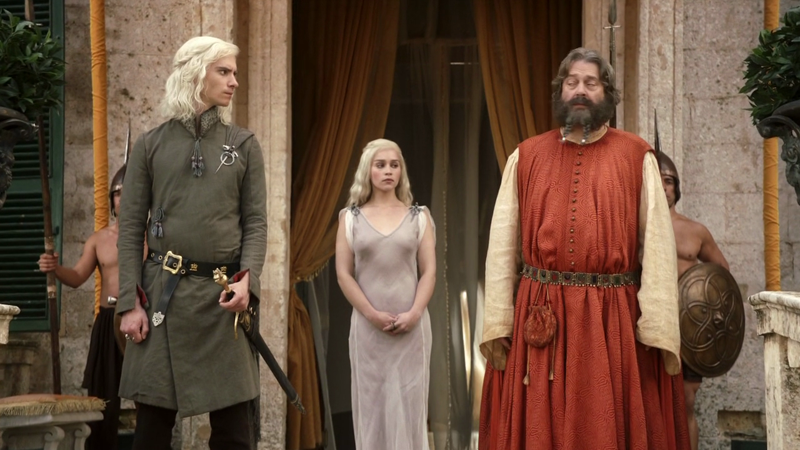 Illyrio is first introduced in the GoT series as the man harboring Daenerys Targaryen and her brother Viserys. He is aiding Viserys in his journey to reclaim the Iron Throne, and in order to secure him an army, Illyrio arranges for the marriage of Daenerys to Khal Drogo. Illyrio was born a peasant and he soon met Varys who had recently arrived in Pentos. The two formed an unlikely friendship and orchestrated a business which made them both very wealthy men. Varys would use his skill of theft and steal items from lesser thieves; Illyrio would return these stolen items back to their original owner for a small fee. This made both men very wealthy and helped propel them to more powerful statuses. Unbeknownst to most, in the 5th episode of season 1, Arya overhears a conversation between Illyrio and Varys (video below). Varys discusses that Ned Stark has discovered the truth of Joffrey, to which Illyrio responds that they’ve killed one hand (Jon Arryn) and they can kill another. In talking about the impending war, Illyrio responds that they are not yet ready for the war that is coming. From this conversation, it is clear that the two have been working together in the shadows, with possible intentions to use the Targaryen quest for the throne to gain more power. This entry was posted in Characters and tagged illyrio mopatis, pentos, Varys. Bookmark the permalink.